Macy’s Union Square is located in the heart of San Francisco's shopping district and encompasses an entire city block, attracting locals and visitors from around the globe. Not only is Macy's a well recognized department store around the globe, but it is also part of San Francisco's history. 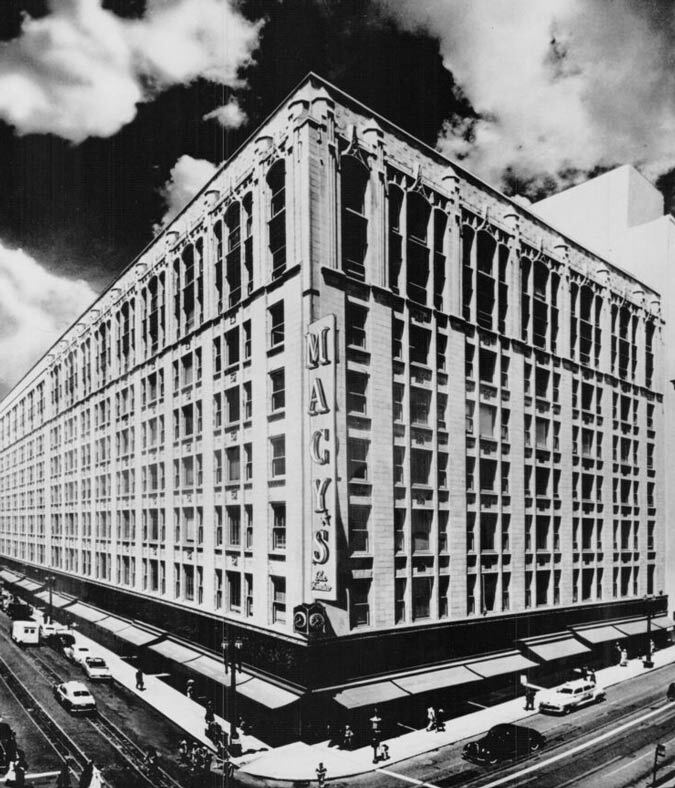 Macy's has been an integral part of San Francisco's shopping and activity scene for decades. 101 Stockton Street was commissioned in 1928 by O'Connor, Moffat & Co., first established in 1866 and the forerunner of Macy's West. R.H. Macy & Company, New York formally acquired O'Connor Moffat in 1945, and in October of 1947 converted the store to Macy's San Francisco. In 1948, major expansion took place, including the adjacent building at 170 O'Farrell Street, and using 101 Stockton's 1928 architect, Louis Parson Hobart. The 1928 and 1947 buildings, as well as the 1974 stand-alone Men's Store were remodeled in the late 1990's. At the same time, expansion took place onto the upper floors of the former I. Magnin building at Geary and Stockton Streets, originally built in 1946. Two buildings on Geary Street were also demolished and replaced, giving the store its now-signature, concave, five-story glass-fronted entry facing Union Square. Today, Macy's Union Square is the second largest department store in the United States, second only to Macy's Herald Square in New York City in actual square footage. It is easily recognizable by its five-story glass facade on Geary St. overlooking Union Square and the Dewey Monument. The jewel of the iconic brand's West Coast locations, Macy's Union Square offers top fashion brands, gifts, housewares, and furniture. Top-notch service and gourmet dining, along with a full calendar of special events, make the store a must-stop in the neighborhood. In 1946, Macy’s Union Square held the first department store flower show. What began as a fragrance promotion in the cosmetics department now annually welcomes the spring season to the Bay Area, treating locals and visitors to a botanical, cultural and community spectacle. In 1971, Macy’s Union Square’s lower level, once cluttered with bargains, was transformed into “The Cellar,” changing the way customers shop for housewares. Due to its success, the Herald Square store in New York City followed suit five years later. In 1983, Macy’s Passport became a benefit fundraiser for local AIDS charities, making Macy’s one of the first companies in the United States to recognize the need for AIDS fundraising. Oscar-winning actress Elizabeth Taylor served as founding chair. Since 1986, Macy’s has partnered with the SFSPCA to host adoptable puppies and kittens in the store’s iconic holiday window displays, resulting in hundreds of adoptions and thousands of dollars raised every year. Every holiday season since 1989, Macy’s gives its gift to the city by lighting a magnificent 83-foot tree, adorned with thousands of energy-efficient twinkling lights and ornaments, in Union Square Park. This beloved tradition is considered the start of the holiday season in San Francisco.